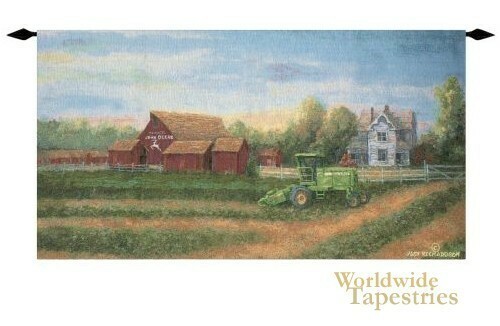 The countryside of the American farmland is seen here in this tapestry “White Farm House”. Filled with gorgeous colors, we see the manor, the farmhouse, the tractor and the crops being harvested. The subject matter of the countryside is set in this work to reflect farm life and the work is beautifully balanced in composition and colors, as well as delicate touches of texture. This tapestry “White Farm House” is lined and has a tunnel for easy hanging. Note: tapestry rods and tassels, where pictured, are not included in the price.